So Strange. I wonder why they built up. It makes me think of the Chena River mansions that grew ever higher to block the other’s view. Winston–it’s a grain elevator–they use an elevator to take grain up, then allow gravity to bring it down–the higher the elevator, the more grain that can be stored. The “shoulders” on this one probably once fed other grain storage bins on either side of the unit. Like many wooden grain elevators built a century ago, this one has been abandoned, and is falling apart–but developing a personality as it fails. This old lady seems to be lacking her accessories. Most grain elevators were near train tracks (in order to ship the grain) or at least truck bays. There is nothing — the supporting cast (to mix a metaphor) is entirely off stage. 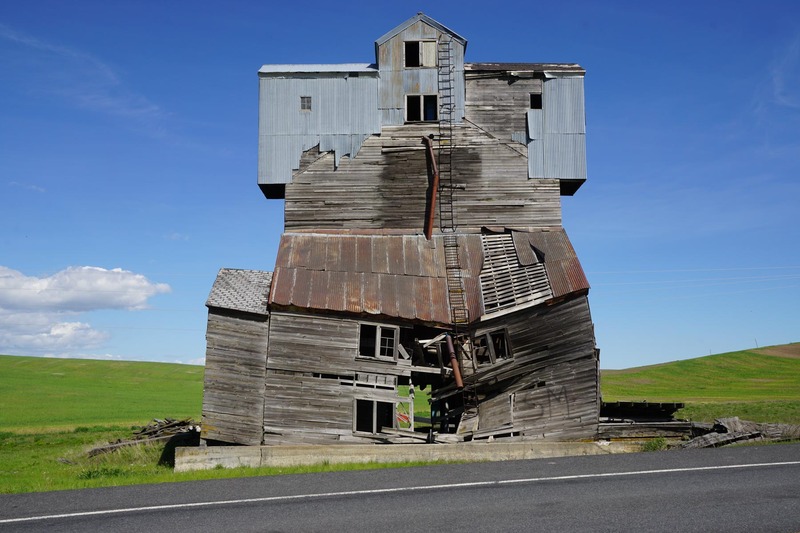 There is no shortage of crumbling grain elevators in grain growing country, especially in the plain states of the US and the prairie providences of Canada. Years ago, I photographed several examples in Kansas. None matched the unique esthetic of this one.